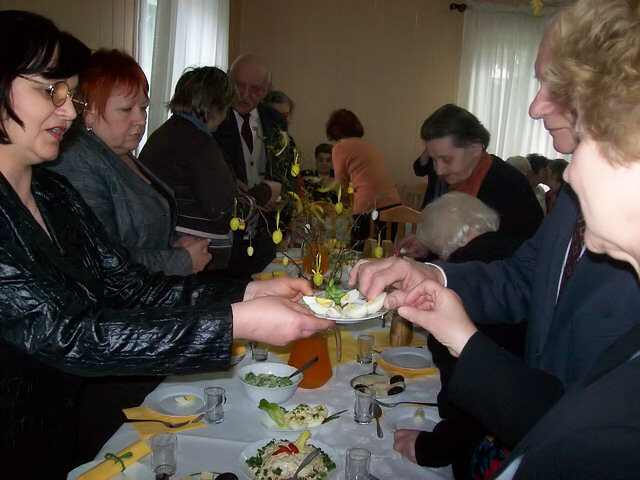 It takes place in Poland during Sunday Easter breakfast. You should use eggs which were blessed in the church a day before. 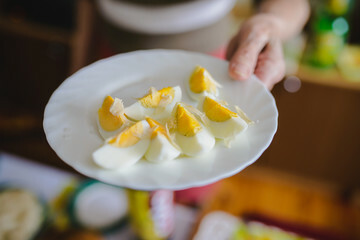 Sharing egg is similar to sharing a wafer at Christmas Supper and also symbolizes friendship, love, forgiveness. .
Cut the eggs into quarters. Put them on a small plate. Each member takes a quarter. Then, approach other family members. Wish them health, prosperity, fulfillment of dreams, passing exams, good children, good grades at school, etc etc. Eat a piece of your quarter. Wait until your interlocutor eats theirs. Kiss them on the cheeks and let them kiss yours. PS. When you run out of your quarter, take another. I heard some believers use more advanced methods. Offer them a piece of your quarter. Take a piece from your interlocutor`s quarter. I couldn`t find another film, this one isn`t the best because TV is on in the background which isn`t appropriate. Sounds and looks like sharing the wafer at Christmas...only different! I had never heard of this one before. Any custom where people share some kind of food and wish each other well while doing it is a good thing, I think. Especially today when so many people don't talk to others face-to-face, but rely on cell phones and texting! 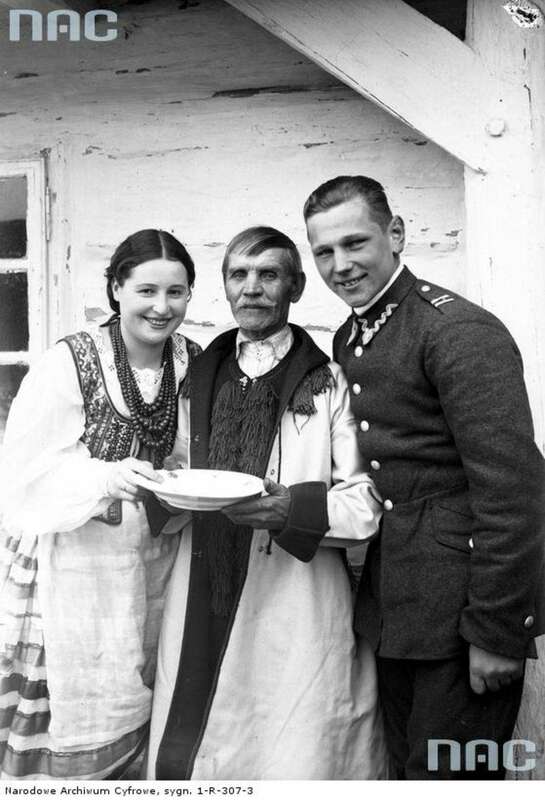 I find it really amazing that after a dozen years in Polish forums there are still basic things you are not aware of as far as Polish traditions are concerned. It means those expert guys in the forums did a lousy job. Hmmm...makes me wonder what else you are hiding from me! !